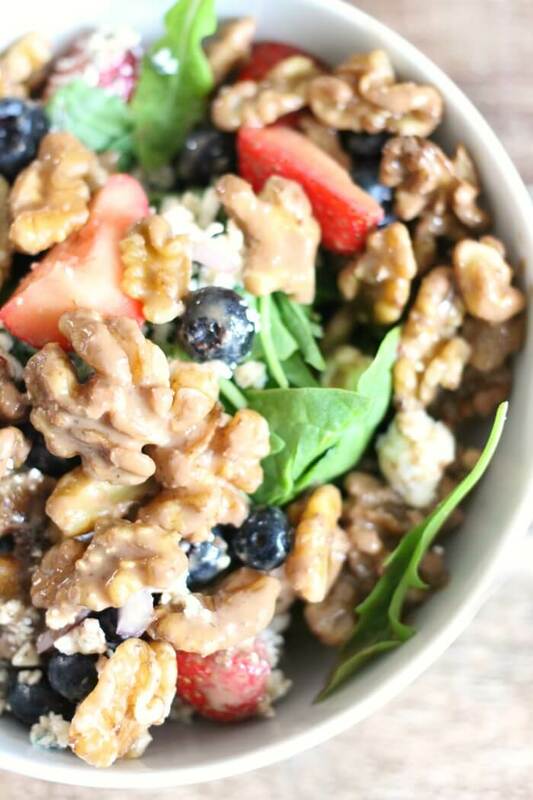 A Strawberry Spinach Salad is the perfect meal to start off your new year! After three months of indulging (hello, Halloween, Thanksgiving, and Christmas! ), this strawberry spinach salad is the perfect palate cleanser! It’s healthy eating, while still being delicious and filling. Bonus, it’s easy to make paleo and weight watchers friendly! Confession: until a couple years ago (okay, maybe last year), I thought fruit in salads was totally gross. I know, I KNOW. What was wrong with me?! I’m not sure exactly what flipped the switch in my culinary tastes, but these days I just love love love fruit in my salads! (p.s. I totally love it). Right now in Florida (where I live!) it’s strawberry season (December through April! ), so we’re getting the most beautiful and flavorful fruits from farms that are sometimes in my own town! The kids have been teasing me because I’m adding blueberries to absolutely everything (um, have I mentioned, they’re in season and taste amazing?!). These salads are perfect for make ahead meals to bring on a picnic (yay, summer!) or to work, or even for prepping food ahead of time for a party. 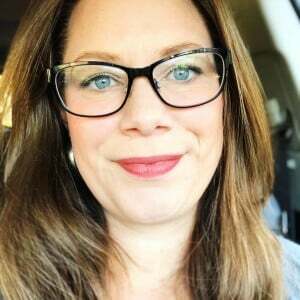 I love putting them in mason jars (click here to see my favorite jars), but don’t worry if you don’t want to shell out the cash for name brand jars – just save your old pickle and spaghetti sauce jars. Sterilize them in some boiling water and you’re good to go! Upcycling for the win! 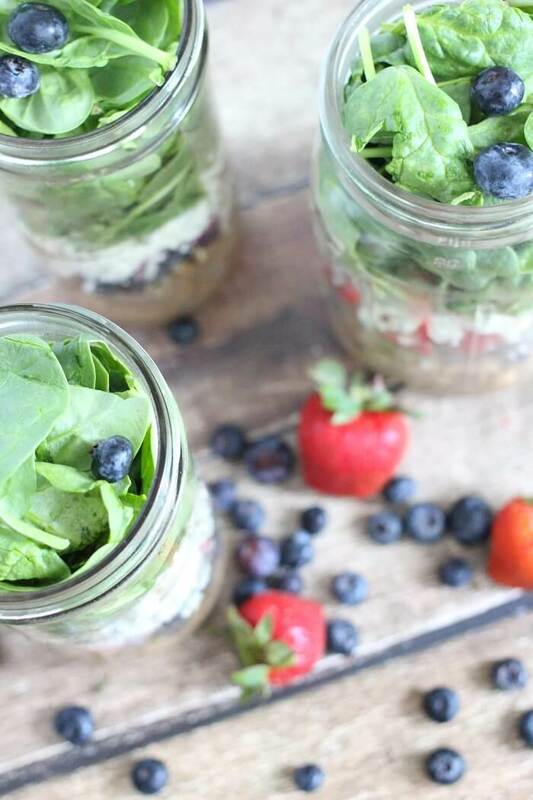 Strawberry Spinach Mason Jar Salads are so crazy easy to make and super versatile. I love (love love love) that I can make them on Sunday night and they’ll stay fresh and delicious all week long. This little dude kept sneaking tastes of the blueberries and strawberries for himself while I was preparing the salads. 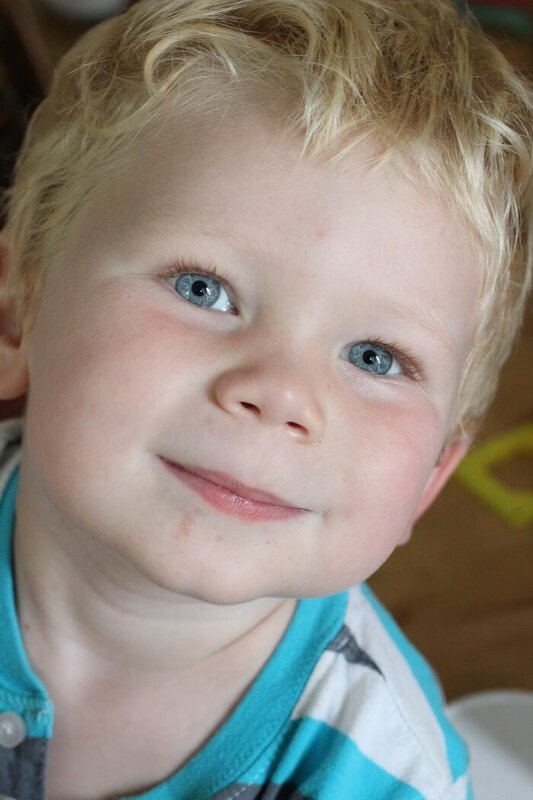 He turns three in a few weeks (three!!!) and calls them “strawbabies” and “boobubbies” – it’s basically the cutest thing ever. The super secret (okay, not really secret at all) trick is putting your dressing and protein on the bottom and not letting the lettuce get wet. 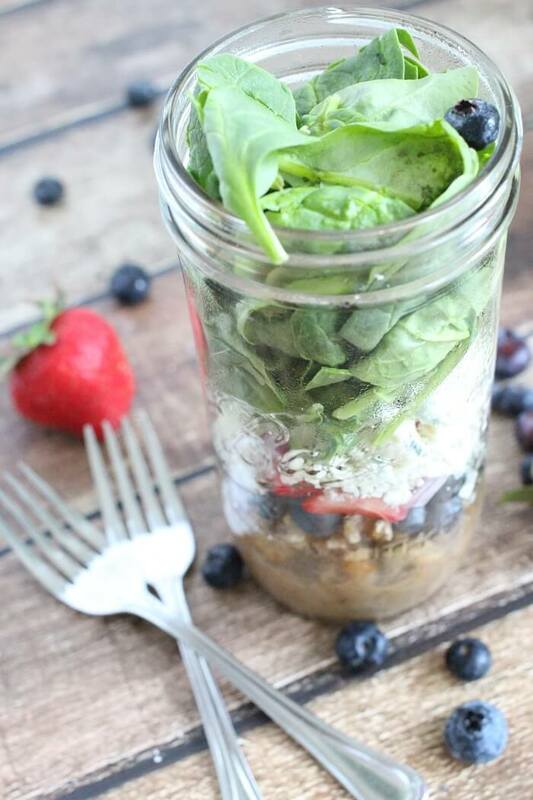 Make sure you check out our delicious Balsamic Dijon Dressing, it’s my favorite with this strawberry spinach salad! So long as your lettuce stays dry, the salads will last several days. Yay! 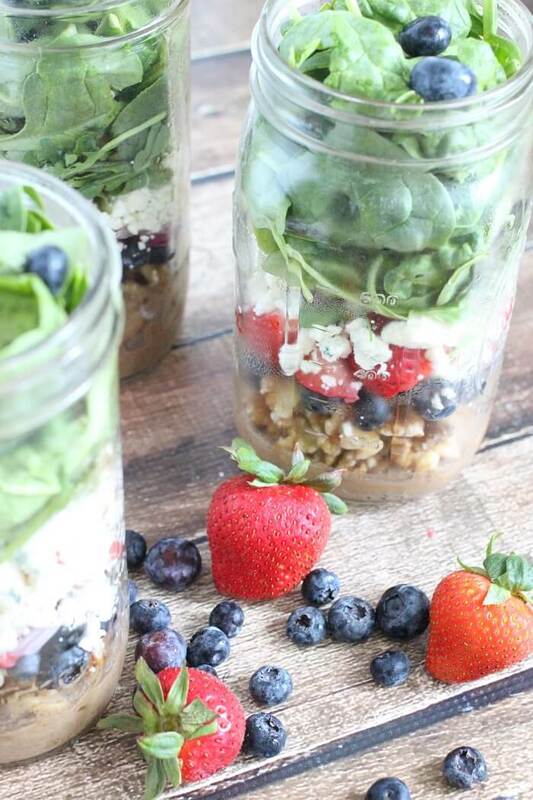 I’m sorry, but can we just gush over those strawberries and blueberries? Hashtag, gorgeous. It’s fantastic that we can hothouse grow things and are able to eat healthy produce year round, but there’s something really special about eating a fruit or vegetable that’s in season. And bonus points if it’s grown nearby. (Hey there Florida produce! I’m talking about you). Finish your healthy meal with a treat of strawberry slab pie or strawberry yogurt cake! Apple Blue Cheese and Walnut Salad – Introduced to me by my friend Stacy who claims she’s not much of a cook (liar, liar, pants on fire), this Apple Blue Cheese and Walnut Salad is a hit everywhere we take it! Spinach and Pear Salad – Use fresh or canned pears, and mmmmmmm, enjoy! Carnitas Salad Bowl – It’s like street tacos! But in a bowl! Such a yummy idea. Fig and Blue Cheese Spinach Salad – You had me at figs. And blue cheese. You won’t believe the dressing we pair with this Fig and Blue Cheese Salad, it’s out of this world! Yam Arugula Salad – I first had a yam and arugula salad when I was cruising the Caribbean. Now I can’t get enough! Loaded Burger Salad – For when you don’t really feel like a salad, but want to pretend. See also, perfect for paleo or keto diets! Italian Antipasto Salad – Just like grandma used to make! But on lettuce, and with dressing! OXO Good Grips Green Salad Spinner – Make sure your salad isn’t watered down by using this OXO salad spinner. We love it for spinning our broccoli before roasting too! 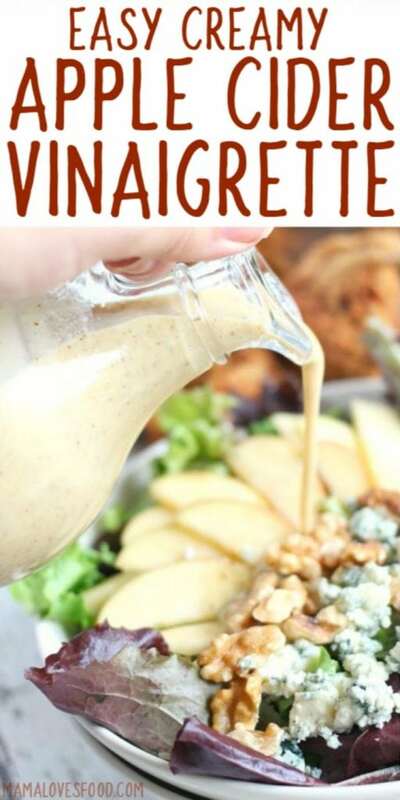 Anchor Hocking Glass Cruet With Stopper – Are you obsessed with making your own salad dressings like I am? You’ll need a dozen or so of these. Yassssss. Lipper International Small Bamboo Bowls, Set of 4 – Children of the eighties will be especially nostalgic for wooden salad bowls. Why did we always eat salad out of wooden bowls? I don’t know, but P.S. I love it. Lipper International Bamboo Salad Bowl – You’d better believe we’re serving the salad from a wooden bowl too! 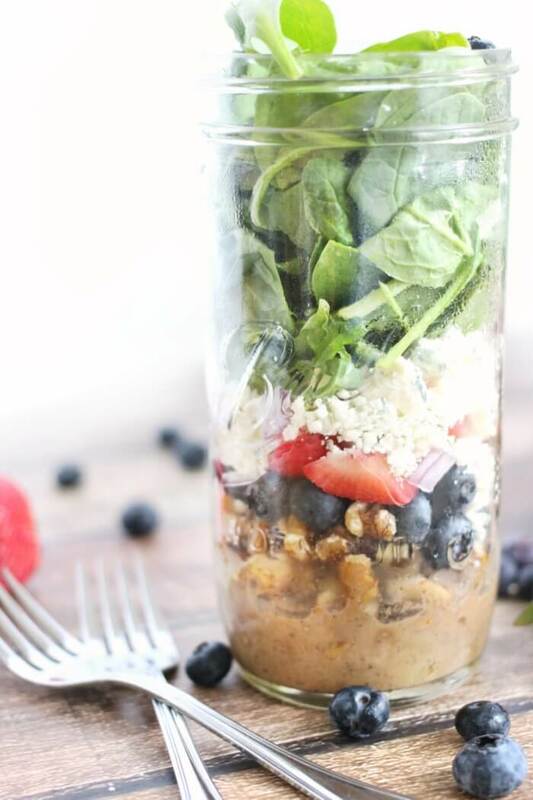 Wide Mouth Pint and a Half Mason Jars – these are the best mason jars for salads. Perfect size and nice wide opening, so you can eat the salad right from the jar if you’d like! 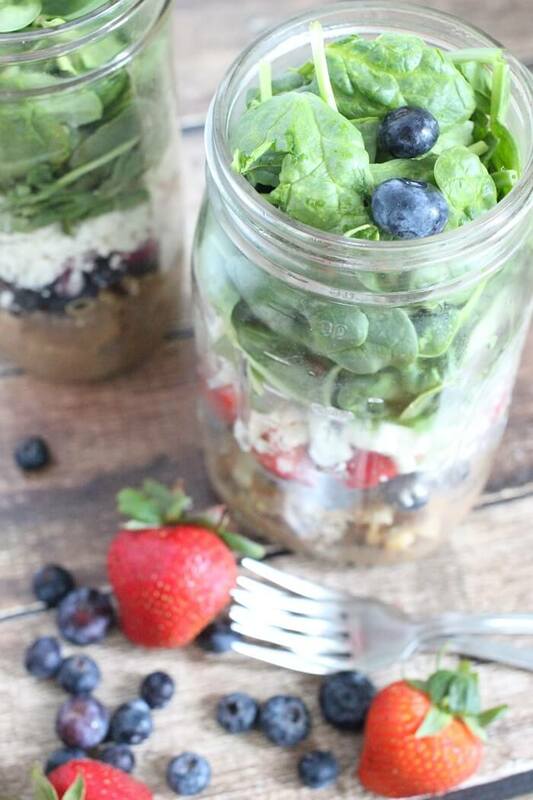 Spinach strawberry salad - with blueberries! 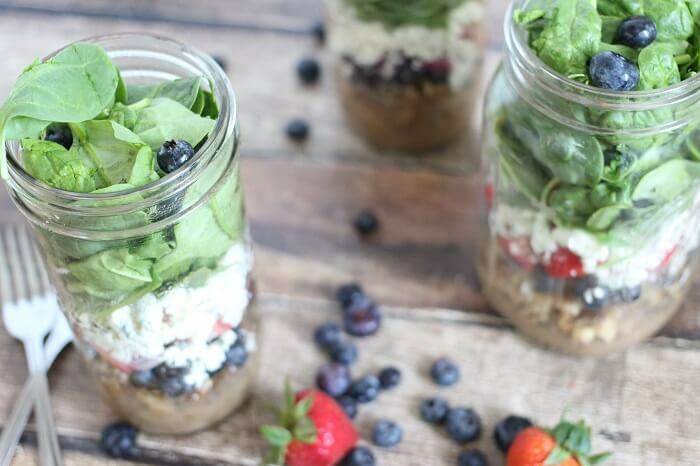 - is a delicious and simple lunch idea that can be made ahead in mason jars! Fresh spinach and/or arugula I like a mix of the two! 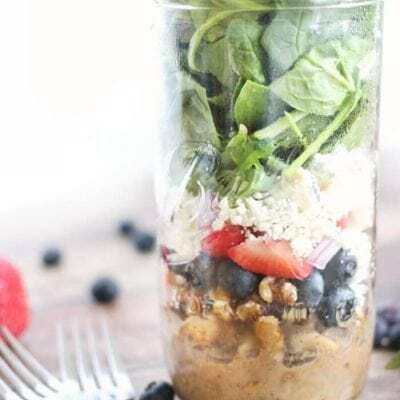 Layer ingredients into mason jars in the order listed (begin with dressing - here's the link to my favorite balsamic dressing! ), in the desired amounts. Seal tightly with a lid and store in the refrigerator. When you're ready to eat, check and make sure your jar is sealed tightly, then give it a good shake to distribute the dressing evenly. 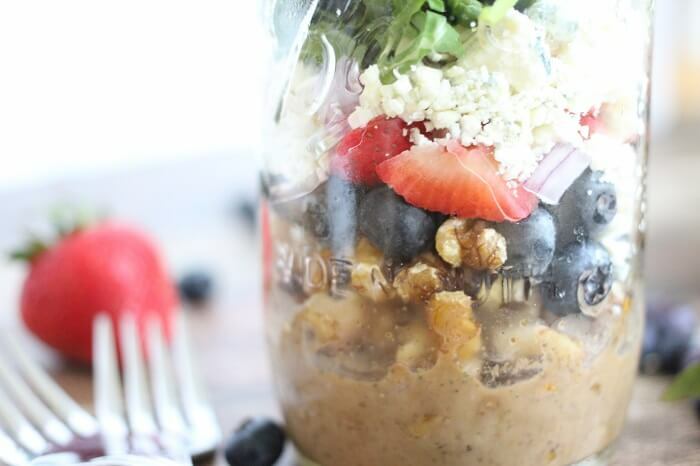 Eat directly from the jar, or pour into a bowl. 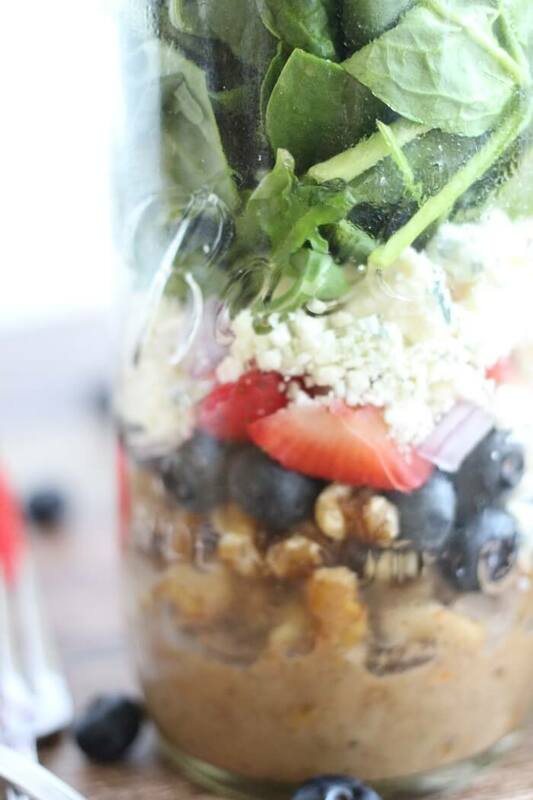 Layer ingredients into mason jars in the order listed (begin with dressing), in the desired amounts. When you’re ready to eat, check and make sure your jar is sealed tightly, then give it a good shake to distribute the dressing evenly. Delicious! I’ll take a jar for lunch today! I will make this salad and it will be good to have when I need lunch for work! Thanks for this recipe and I love the recipes that you send my way. Happy New Year to you! Happy 2018!